To get to New Inlet, Corncake Inlet, or the Cape Fear River, you had to go toward Zeke’s Island, where they had broken the rock wall apart. 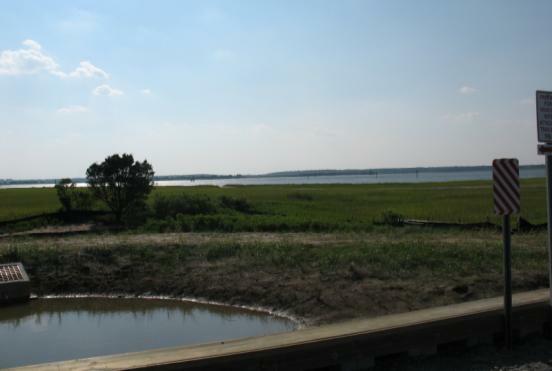 They had built the rock wall from the end of U.S.421 to Zeke’s Island and then on over toward Bald Head Island between 1875 and 1881 to reduce the flow of water through New Inlet that caused severe shoaling in the Cape Fear River. Ray’s Dad and his partner started charter fishing, first taking people through the 2nd bay to fish on the island between New Inlet and Corncake Inlet or to surf fish on the North end of Bald Head Island. The people would go for the day, or would spend a night or two and catch lots of fish. Then his Dad and D.P., as people called him, got a larger boat and started taking fishermen into the ocean for trolling and bottom fishing. They had no radio, no depth (fish) finder, no compass, no nothing, just a 26 foot open boat with twin 25 hp Evinrude or Johnson Outboard Motors. New Inlet was so shallow, sometimes the fishermen would have to get out and walk beside the boat to get over the sandbars before getting into the ocean. Back then it cost $5.00 per person for a half day fishing trip and they caught more fish than they catch now, paying about a $100.00 per person for a half day. Ray worked as a mate for tips and would clean the fish once back at the marina docks for whatever the fishermen wanted to give him. Dad and DP put a small trailer at the Marina to sell bait, tackle, ice, soft drinks and snacks. That 99 year lease is now null and void after his Dad and DP turned it over to someone else. In 1968 his Dad built a larger boat, Flo Jo, and had to run out of Carolina Beach Inlet because of deeper water requirements. CB Inlet opened in 1952 and after that most all the charter boats that had operated out of The Basin had moved to Carolina Beach Marina. His younger Brother Tommy started the Pirate Head Boat Fishing Business after working with his Dad as a Mate and then buying a boat from him. The Head Boats would carry 50 – 75 – 100 fishermen. Ray worked as a Mate for Captain Lewis (Baby) Davis the summer before he went into the Navy. Ray told me he certainly wished his Dad and DP would have kept that lease and he now had it as a Marina with a Boat Ramp. What a GOLDMINE it would be!